From The Compound: Grandma Hazel & the newest member of her family. Grandma Hazel & the newest member of her family. Here are a couple more that didn't upload. 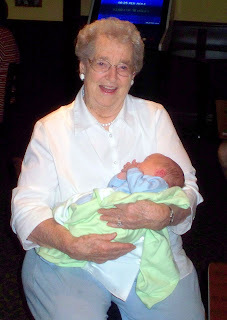 Grandma with little baby Aaron. He is pretty darn cute. Tim and Nikki are such proud parents. Congrats to them! 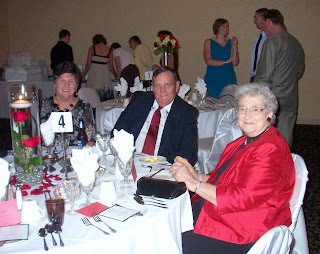 The other picture is of Grandma with her brother Blair and his wife Olga. Blair is my Dad's namesake, so he is the reason for Owen Blair's cool name. It was nice to see them. The last time we saw them at the Holden Reunion...Jed tried to fill a water balloon with spray cheese, and it exploded on his shoe. I am not totally sure, but I think a mass quanity of alcohol was involved...some of it being Blair and Olga's if I recall correctly!! Anyway, looking good Grandma!